If you are in the market for a juicer, but don't know where to start, and more importantly are budget conscious, then this guide will certainly help you, as we uncover the best 3 juicers under $100. As a housewife and a mother of two, I know how important it is to make your family’s health and overall well being the top priority. It’s a good thing that I figured out how to slip fruits and veggies into their daily meals without them noticing. I realized that juicing vegetables instead is a really good idea. ​It’s just an added bonus that fresh juices have multiple health benefits to﻿﻿o. Raw fruits and vegetables have highly concentrated nutrients that we won’t be able to get from cooked vegetables and bottled fruit juice. Today I want to share with you (in my opinion) the 3 best most affordable juicers on the market. All of which are currently under $100! Affordable juicer that produces high quality juice & easy to use. A little noisy. Our pick of the best juicer under $100. Produces high quality juice is super easy to use & easy to clean. A great juicer if you are on a super tight budget and want your juice extracted in less than a minute! 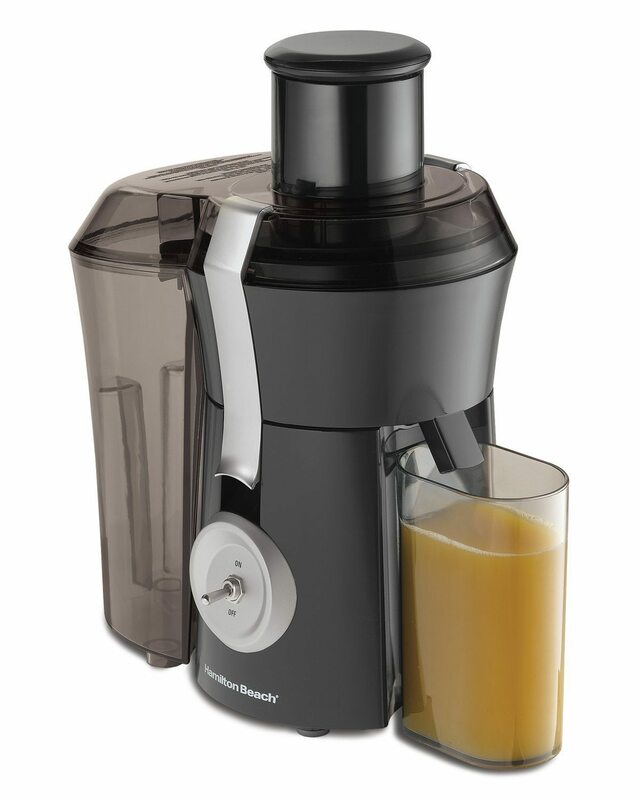 ​The Breville BJE200XL Compact is a centrifugal juicer, which means it has a central spinning blade. This allows for a lot faster juicing, so it’s easier to prepare fruit juices for my kids’ breakfast juices and I can even give them some in their school tumblers. It saves a lot of my time getting ready in the morning! For a centrifugal juicer, BJE200XL is actually really affordable on Amazon. And for an affordable juicer, it really outperforms more expensive models! This juicer is very easy to use and is not complicated like others. I could operate this in my sleep if I wanted to. The blades are powerful enough to go through any fruit and vegetable that you want to juice, and it does so quickly. It also produces more juice than others, and you can see how much drier the pulp residue is when compared with other centrifugal juicers. Each part of the BJE200XL juicer is easy to assemble and remove after use for cleanup. Most parts are dishwasher friendly, although I don’t really mind cleaning it manually because it doesn’t require that much effort. The brush that it comes with helps a lot, too. I’m not really bothered with noise and it wouldn’t have been a problem with this juicer because it gets the job done really quickly anyway, but it doesn’t produce a lot of it. It’s amazing. I can make my favorite juice recipe in the middle of the night while the rest of the house is asleep and it’s not an issue. This juicer has the tendency to hurl some bits and and chunks of ingredients out of its top because the lid isn’t that helpful. You will have to place your hand firmly at the top so it doesn’t fly off. The user’s manual that the juicer comes with is very easy to understand, and therefore makes the Big Mouth easy to use. It’s also a breeze to assemble it before every use. Another thing that I love about it, is the fact that it has a “big mouth”, and you can just toss everything in without needing to slice and dice them all up. You just have to make sure that the fruits and vegetable are washed and peeled if needed, of course. This juicer comes in a very affordable price, and is also easily available on Amazon and other place online. Considering it is a centrifugal juicer and is in the regular size, it’s almost too good to be true. True to its claims, Big Mouth produces more juice than other centrifugal juicers, and produces extremely dry pulp residue which supports this. It powers through the hardest kinds of fruits and vegetables and gives you the most juice one could ever get out of it. It’s also dishwasher-friendly, so you can clean it up easily after use. This juicer works better with firmer, harder produce. You will need more ingredients to get more juice out of it. This juicer can be a little noisy when in use. Measures 16 x 12 x 15.5 in. For a centrifugal juicer, Jack LaLanne Power Juicer is pretty inexpensive. It’s a good option for those who are on a budget. This was my first venture into trying juicers. It juices carrots, beets, apples, and other similar hard produce really well. This juicer doesn’t perform well with softer produce, but that is to be expected from most centrifugal juicers. The real complaint lies on the fact that it doesn’t juice that efficiently. It results to pretty wet pulp residue. It is advertised to be dishwasher-safe, but it’s not. There are also a lot of unnecessary nooks under the lid so it’s difficult to wash afterwards. The Jack Lalanne JLSS Juicer is a little on the noisy side, however most centrifugal juicers are quite noisy comparatively speaking when compared to a typical masticating juicer. Hopefully you now have a better idea of some of the best juicers on the market under $100. The infographic below sums it all up.